This one of a kind mansion of 1 384 sq. m is set on 119 410 sq. m of flawless green landscape and was first mentioned in the second half of the sixteenth century. Neoclassical-style palace, built in 1802, have survived to this day with its spirit of ancient times, gardens and live water throughout the territory. Surrounding with peace and comfort it affords exceptional living spaces, tranquility, and an exclusive style. The distinctive interiors include three authentic apartments on the second floor of the manor and six unique halls – The Great Hall of 230 sq. m, The Beautiful Hall of 150 sq. m, The Chamber Hall, The White Fireplace Hall, The Wooden Fireplace Hall and The Historical Hall. Additionally, the territory embodies a 41 room guest house and a cozy 7 room hotel. Taujenai manor is a truly unique and beautiful property offering privacy, tranquility and charming surrounding parks. This one of a kind mansion of 1 384 sq. m is set on 119 410 sq. m of flawless green landscape and was first mentioned in the second half of the sixteenth century. Neoclassical-style palace, built in 1802, have survived to this day with its spirit of ancient times, gardens and live water throughout the territory. Surrounding with peace and comfort it affords exceptional living spaces, tranquility, and an exclusive style. The distinctive interiors include three authentic apartments on the second floor of the manor and six unique halls – The Great Hall of 230 sq. m, The Beautiful Hall of 150 sq. m, The Chamber Hall, The White Fireplace Hall, The Wooden Fireplace Hall and The Historical Hall. Additionally, the territory embodies a 41 room guest house and a cozy 7 room hotel. 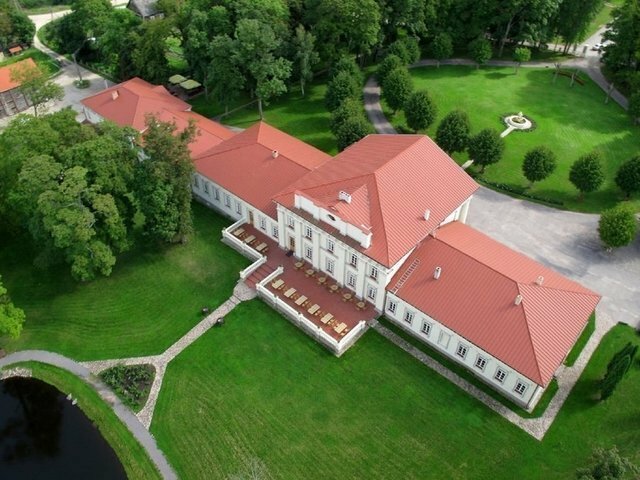 Taujenai manor is a truly unique and beautiful property offering privacy, tranquility and charming surrounding parks.